NEW BRITAIN – A community art mural was created Thursday on a portion of Jubilee Street with the goal of providing more public space in the East Side neighborhood. The creation of the mural was done in partnership with the Capitol Region Council of Governments and the YWCA of New Britain. 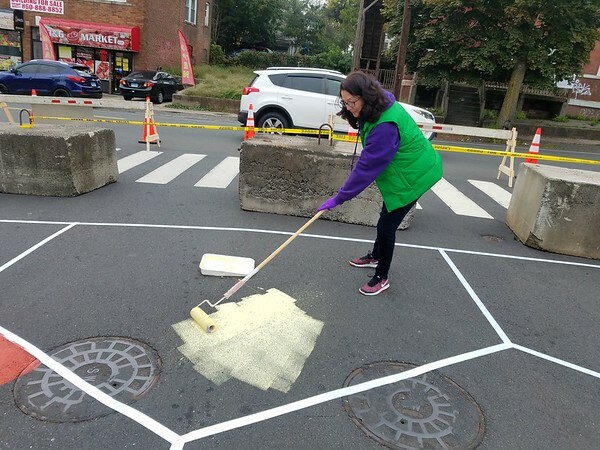 Stewart, volunteers from the city and other organizations took part in painting the colorful honey comb design on the street. Mike Lyden, of Street Plans, a consultant to CRCOG worked with the city to execute the project. 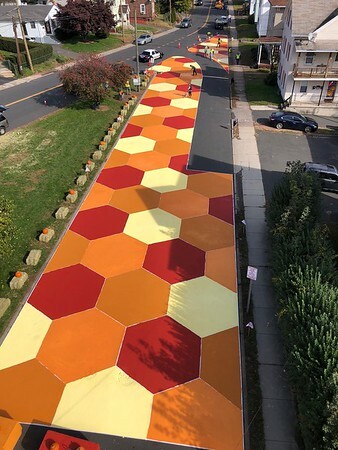 Connected hexagons representing the city symbol in orange, brown, yellow and red were painted to form the mural which will be in place for about a month. “It’s colorful, it’s bright, it’s fun,” Lyden said. “It’s a way to invite people in the space. It will very visibly increase the size of the park triangle here in the public space, that’s the intent. Lyden said that the space, which is part of the Jubilee Street, will now be used as a community open space that the residents can utilize. Sharon Beloin-Saavedra is running for office and the area were the mural was painted is part of her district. Posted in New Britain Herald, New Britain on Friday, 26 October 2018 17:44. Updated: Friday, 26 October 2018 17:50.